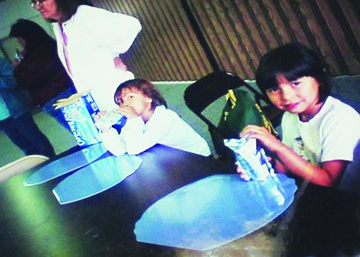 Maria Martin enjoys juice time at the first language camp, held in 1996. At this year’s closing ceremony for the 20th Annual Lushootseed Day Camp, Maria Martin, better known as Miss Maria to the Tulalip young ones, was acknowledged for being an inaugural participant at the first-ever Lushootseed camp in 1996. 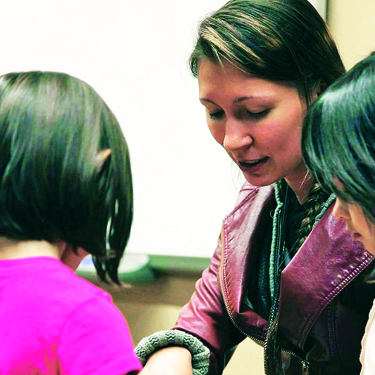 Fast forward 20 years to the present and Miss Maria has come full-circle, now a Lushootseed teacher and instructor for the 2015 rendition of the language camp. “It’s such a special feeling knowing we are now celebrating our 20th year of language camp. During this year’s camp we had a lot of first time attendees, they are only five-years old, and we were able to talk to them about how Miss Maria started out being at the very first language camp 20 years ago,” says Natosha Gobin, a fellow Lushootseed Teacher and instructor at the annual language camp. “She was one of our very first camp attendees and here she is now as one of our Lushootseed teachers. We wanted to pass this message onto our kids because it’s pretty amazing. Miss Maria has only fond memories of the early years of language camp that unknowingly shaped her future. “Lushootseed language camp has been a part of my life for years. It’s a reunion of friends, family and history,” says Maria. “You get to attend a summer time camp where you’re able to be reunited with people you may not normally see and have fun together. You get to learn things that aren’t offered just anywhere. It was a place I got to learn about my people and through that learned who I wanted to be. As the participants, teachers, and even the format of language has changed so has Miss Maria, but her goals will always remain the same. This entry was posted in Tulalip News and tagged education, language, Lushootseed, Maria Martin, Tulalip Tribes by Kim Kalliber. Bookmark the permalink.